XOXO, Facets, and the Human Side of Technology – Sanspoint. 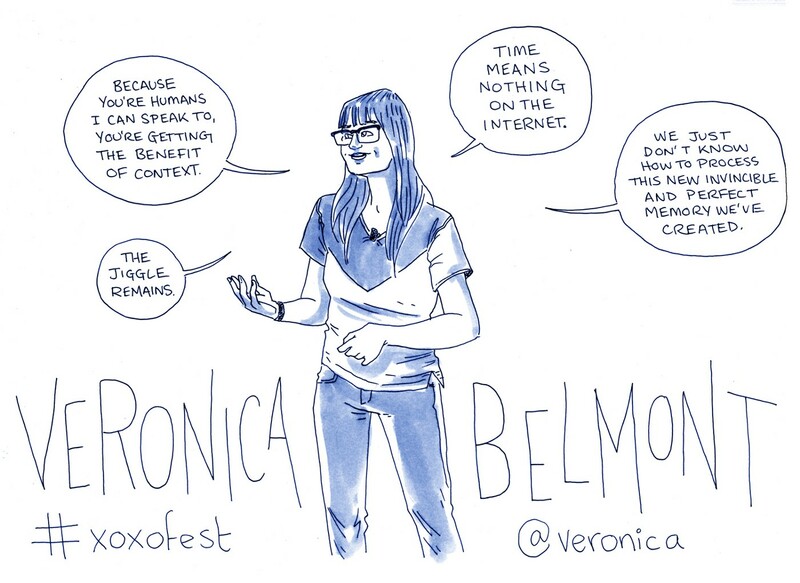 This past weekend, I sat, and refreshed my Twitter feed as a whole host of people I admire from the Internet gathered in Portland for the XOXO Festival. Some were speaking, others just attending. They include: C. Spike Trotman, Virginia Roberts, Merlin Mann, Zoe Quinn, Myke Hurley, Anil Dash, Alex Blumberg, Dan Benjamin, and a bunch more. I’ve eyed XOXO longingly for the last couple years, but the buzz around this year’s was tremendous. Even despite #Gamergate nonsense trying to flood out the #xoxofest hashtag, Twitter was the best way to keep up from three hours ahead and a continent away. Lucy Bellwood’s livesketches, though I only saw them after the fact, were also incredible. One of the things I find so compelling about XOXO, despite both never having been, and being unlikely to go (cross-country travel and accommodations are not cheap) is that it’s only nominally an “arts and technology conference”—the focus of the talks is on the human side of all of it. They’re chock full of personal stories, and that’s important. The talks from 2014 that stick out at me, from watching the videos are Anita Sarkeesian, Justin Hall, and Darius Kazemi. (So much Darius. I need to re-watch that.) Of 2015’s talks, Spike, Zoe Quinn, and Anil Dash’s are at the top of my list—in particular Zoe’s exploration of the nature of Internet Trolls—a topic she’s very, and unfortunately, well qualified to discuss. Probably the closest I’ve come to an experience akin to XOXO is the recent, inaugural Facets Conference in Brooklyn this past year. I wrote my thoughts on the event back in May, and I swear by them. There is, all-too-often, a human story that gets lost in technology, and the tendency of technology people to focus on the object and the occasional, high-profile creator thereof. We get hagiographic biographies of rich CEOs, and lip-service to what their creations can enable us to do. Every speaker at XOXO, and every speaker at Facets, used technology to make something. They picked up a megaphone, and used it to find a voice that would have, perhaps otherwise, not been heard. Wanting to be heard is an inherent human desire, after all. We write, we speak, we draw comics, we code, we make physical goods, and we want others to see them, touch them, maybe pay for them. Technology gives us the leverage to get our things in front of potentially millions of people with a lower, and lower cost of entry. Every post, every podcast, every app, every piece of home-crafted jewelry is a lottery ticket for potential future success (Darius Kazemi again!). And success doesn’t necessarily mean striking it rich. 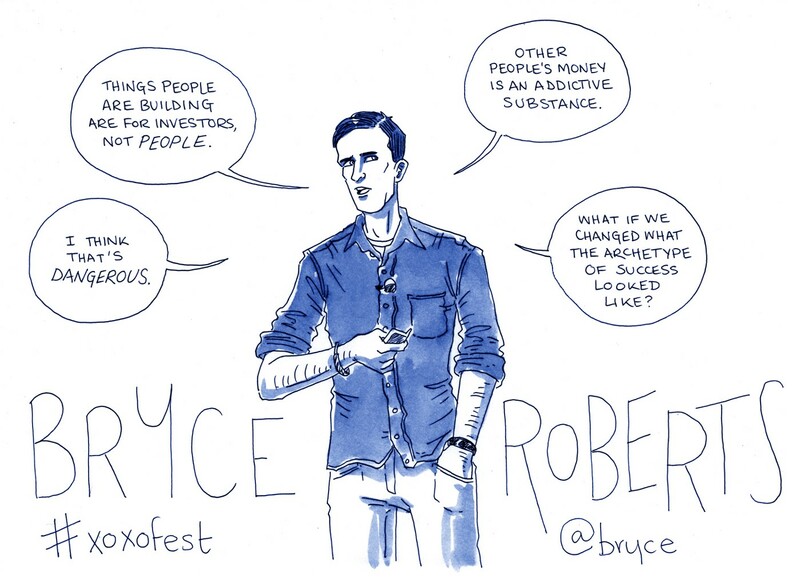 One talk that looks interesting, at least from Lucy’s livesketch, is Bryce Roberts, who “wondered if another [VC] model was possible, helping to fund long-term, sustainable independent businesses without selling out.” After my own experiences with Venture Capital, this really speaks to me (as regular readers might know. Just flip through my writings on the business side of technology to see. This is a relevant one I’m proud of. Perhaps one day, I’ll make it out to XOXO. Or, perhaps Facets will become the East Coast XOXO. (It’s certainly off to a killer start.) Even staring at it from afar, through a Twitter feed, and anxiously waiting for the videos to go up, I’m inspired to pick up my megaphone again, try to find my voice, play a lottery ticket, and get heard. It’ll take time, but as Veronica Belmont says, “Time means nothing on the Internet”. I know these people are all speaking my language: let’s make things and tell stories. We have the tools, let’s use them, instead of fetishizing the companies that make them.